It’s a struggle that many of us with lower nose bridges or smaller facial features have faced. How exactly do you properly pull off oversized glasses without looking like you’re drowning in your frames? Oversized glasses and sunglasses has been seen as a fashion statement for several years now, and the trend doesn’t seem to be going away any time soon. The oversized eyewear style revolutionized fashion trends in the 1960s, and has since returned to catwalks and streets all around the world. 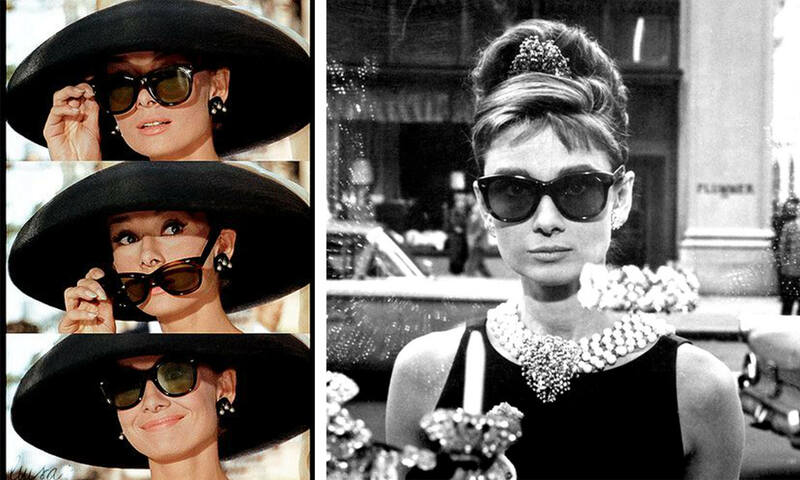 Who can forget Audrey Hepburn’s iconic oversized sunnies in Breakfast at Tiffany’s? Petite girls can’t wear oversized anything -- you’ll look like your drowning! You shouldn’t do anything to call more attention to the fact that you’re petite. Regular things already look oversized on you. You shouldn’t go any bigger than that. Guess what? The time has come to embrace your petite face! The term “oversized” inherently means “too big,” leaving many people to think that literally means the glasses should be too large for your face. However, this is definitely not the case. With proper care, you too can comfortably and fashionably wear this style, while looking like the glasses we made for you, instead of wearing you. Properly fitted nose pads help prop the frames up onto the right parts of your face, and avoid contact with your cheekbones. If your cheeks touch your lenses when you smile, that’s not the best fitting pair for you! This is especially important with oversized eyewear, as the weight of the frames can place even greater unwanted pressure on your nose bridge and temples, causing red marks and slippage. Ashley is wearing her oversized Union in Crystal from Topology. She adjusted the height of her glasses to create an oversized look. The nose pad on the frame is extended outward to avoid the bottom of the frame resting on her cheeks. Left: Unfitted nose pads = serious slippage, resulting in the constant need to push up the frames. Right: A better fitted nose bridge, which keeps the frames in a perfect & more comfortable position on his face. “Oversized” isn’t a size -- it’s about what looks oversized in proportion to your facial features. What will be oversized for you, might not be for someone else! When shopping for oversized glasses, keep in mind that wearing oversized eyewear that is too big can create a bug-eyed look. You might be wondering, "How can I tell if my glasses are too big or wide for my face?" 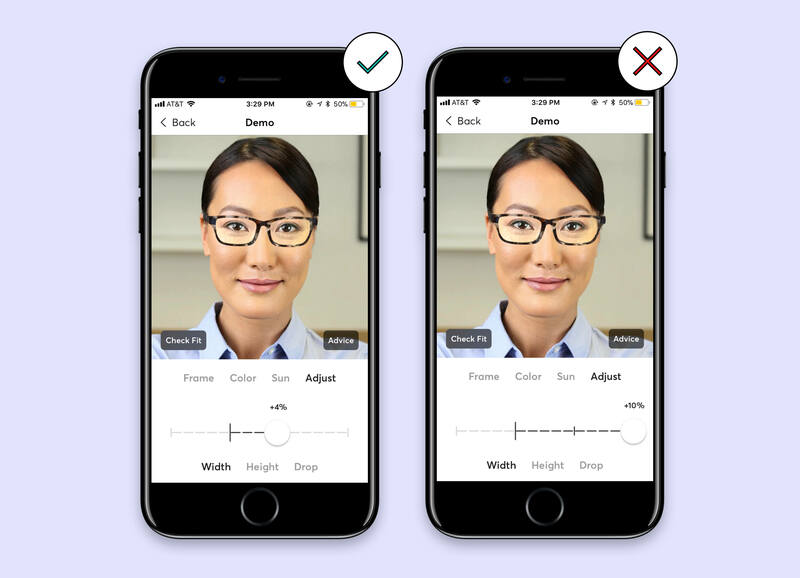 The best and easiest way to tell if you glasses are too big or wide for your face is looking at your pupil placement. You should aim for your eyes to be positioned at the horizontal center and vertical top third of your lens to avoid looking cross-eyed. Left: Adjusted the width and height on Ashley's Union frame to create the perfect oversized proportions. Right: The width on the frame is too wide, causing Ashley's pupils to not be horizontally centered within the lenses. Well-proportioned oversized glasses will ideally let your eyebrows peek through (try wearing them a little lower on your nose than your usual eyewear) and enhance your overall look by balancing out your other features. Some say the perfect oversized glasses can even give a more youthful appearance! Read more about how to find the best eyewear for you, your face, and your prescription. 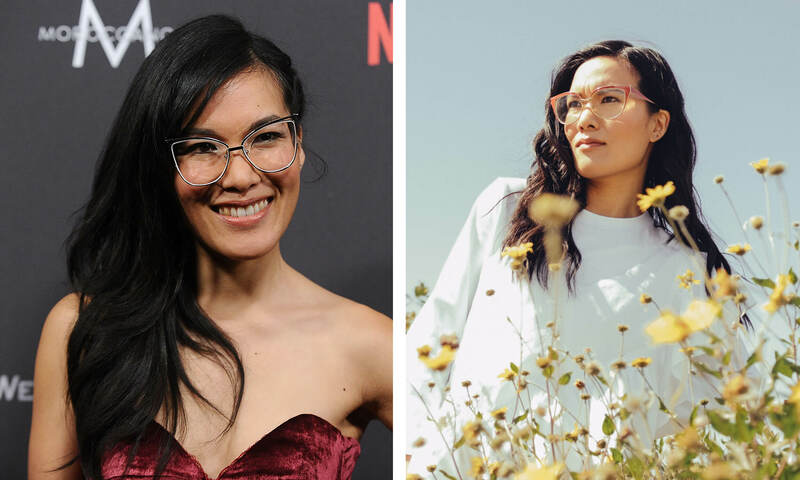 Choosing to wear oversized glasses is a bold choice within itself, but, there are definitely a couple different ways that you can go even bolder. Traditionally, when you’re styling and oversized pair of glasses, you’d choose a style that looks good on your face at a normal ratio and then bump it up. If you want to make even more of a statement, you should choose a style that you wouldn’t normally reach for. Or, maybe you wouldn’t normally go for a cat-eye shape, but an oversized cat eye is actually your new jam! 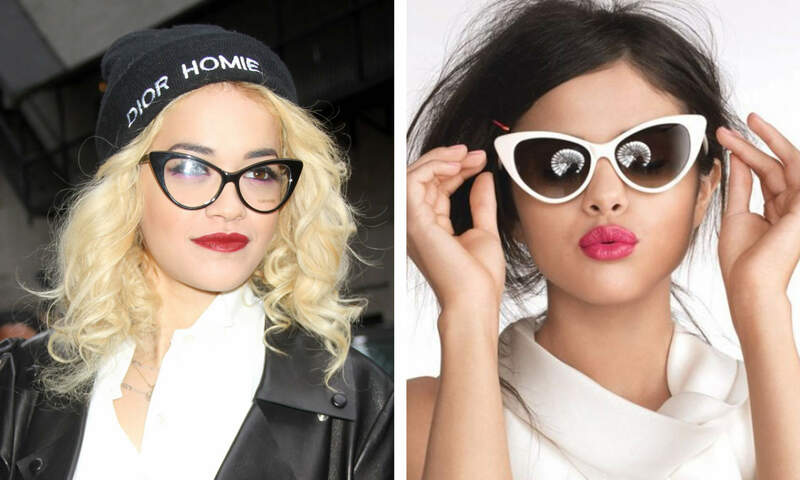 Rita Ora and Selena Gomez rocking oversized cat-eye glasses. The same principle applies for color. Instead of sticking with a traditional color that you know looks good on your skin tone, amp it up with a pattern or variation of that color. Look good in black frames? Amp it up with a neutral pattern. 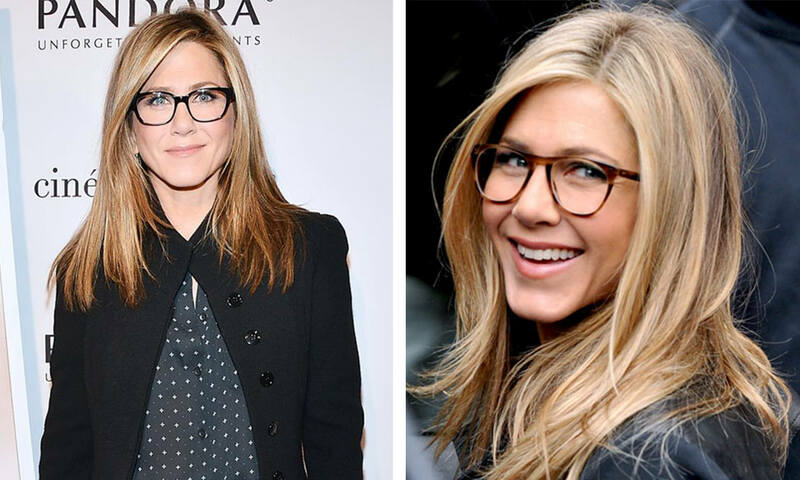 Jennifer Aniston looks classic in black oversized frames. She amps up her oversized frames with a neutral pattern for a more relaxed look! Always reaching for neutral or tortoise frames? Amp it up with a color instead! 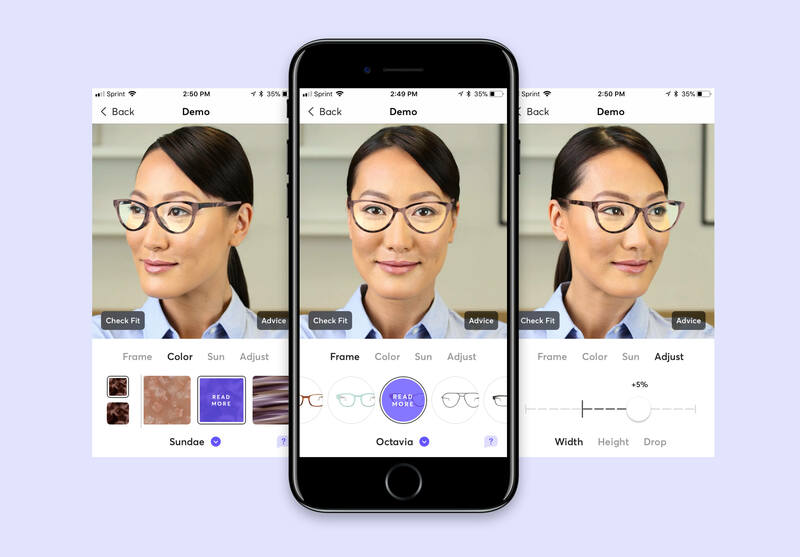 Of course, the best way to truly guarantee a perfect fit is to have glasses that are created just for the unique contours of your face. Are my glasses too big for my face? How can I get my glasses to not touch my cheeks when I smile? Where can I find oversized glasses for my small face? 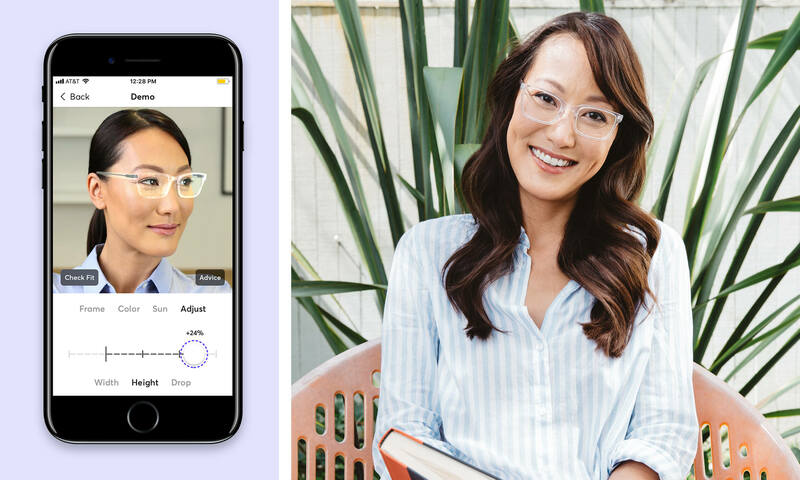 Design your own pair of oversized glasses or sunglasses using the Topology Eyewear app. You can make adjustments to the height, width and drop to ensure a perfect fit. At Topology, we create modern bespoke eyewear, for everyone. Each pair of glasses are sculpted from the finest Italian acetate or light stainless steel into the perfect fit for your nose bridge and face. 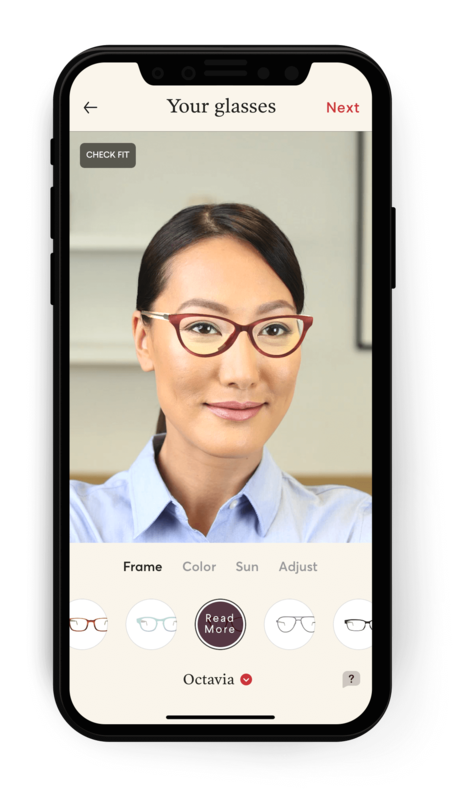 The process is simple: take a selfie, design your style, and order a risk-free prototype to test out in real life! They're guaranteed to fit perfectly or we'll make them again for you, free of charge. Start designing your perfect pair on our iOS app!